😂 Priorities! I hope you find a way to keep sewing! I am in a vary similar place to you. Knitting is what I do when I get on the train in the evenings to touch something real after a day of working on a computer. Photography is what I do to add to the story of my life. I take pictures of our travels and adventures with our girls so I can remember when when share with other people. Sewing is for me only. It may feed some subconscience need for control, since I spend my day pinballing between everyone else’s priorities. I think my desired wardrobe and tastes my just enable my desire to “to do it for myself”. Hm. That’s really interesting. I love reading about your reasons for doing each of these things. Thank you for sharing, and I’m glad the post resonated with you. Love this post and the idea of asking and thinking about why we do what we do. 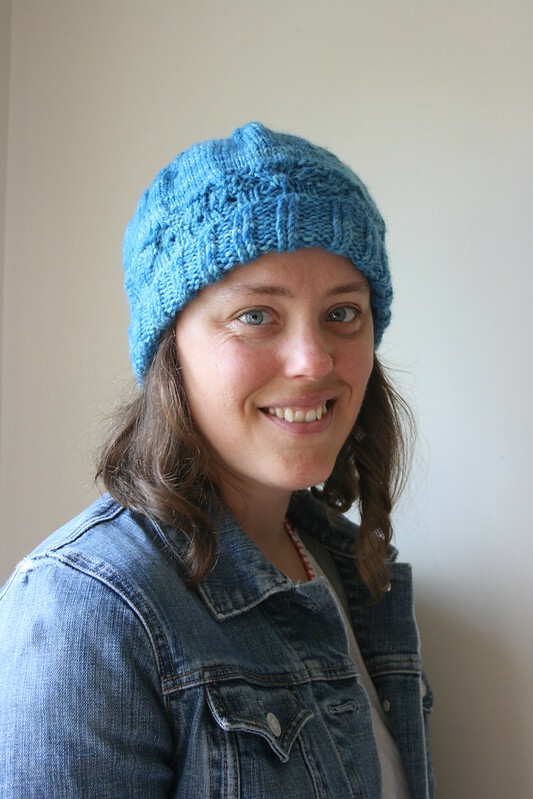 I knit and crochet to keep my hands busy while I watch TV, so that I don’t engage in more destructive habits (like eating, picking at dry skin, etc.). I’m like you in that I’ll always choose done over perfect. I also like to have something at the end of my labors… a cowl, a scarf, a little cactus! I love this. Thanks for sharing what you like to do and why. I also really like having something at the end of my labors. I love making things I can use in some way. Thanks for your comment! I love the title of today’s blog! Ha! 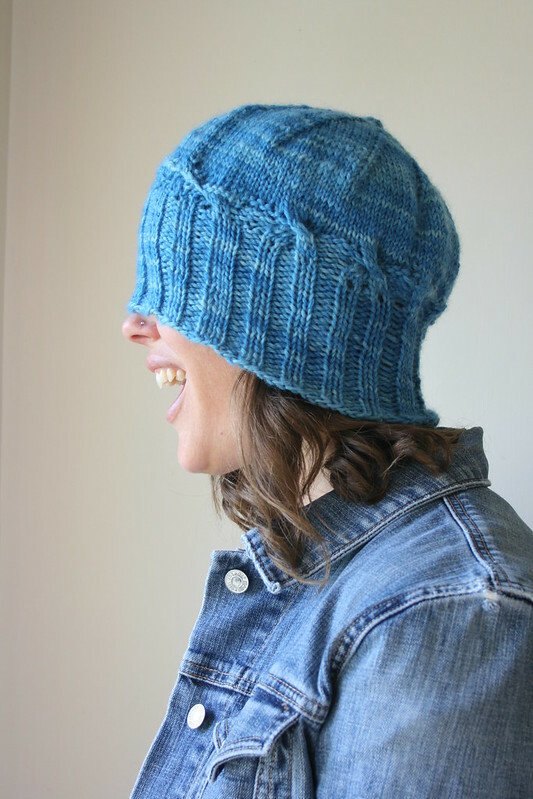 The top of the hat and the yarn you used is beautiful. 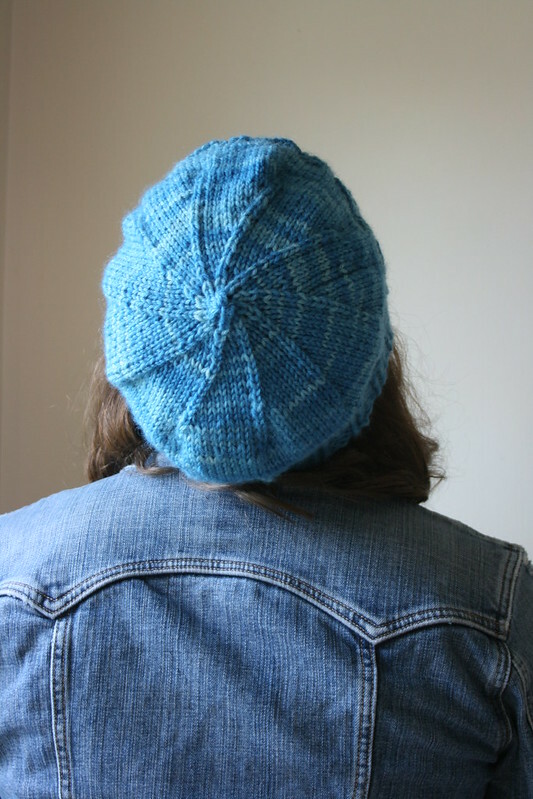 Can you get away with wearing it like a “slouch hat” (is that what they call them?) ? That color is great on you. In my opinion, you are an excellent photographer and seamstress. And that’s a lot!! Thanks for your honesty in sharing your hits and misses. I love the color of your hat on you!! I’m not much for knitting – I have tried and always fail. I create just to have fun, and for me, knitting is not fun:). Sewing clicks all of the boxes for me though! Thanks! I can understand your perspective. Sewing is definitely my favorite. I think with crafts, since we don’t have to do them to survive (like in times past), it’s only worth it if you get some satisfaction and enjoyment from them. I love this yarn. 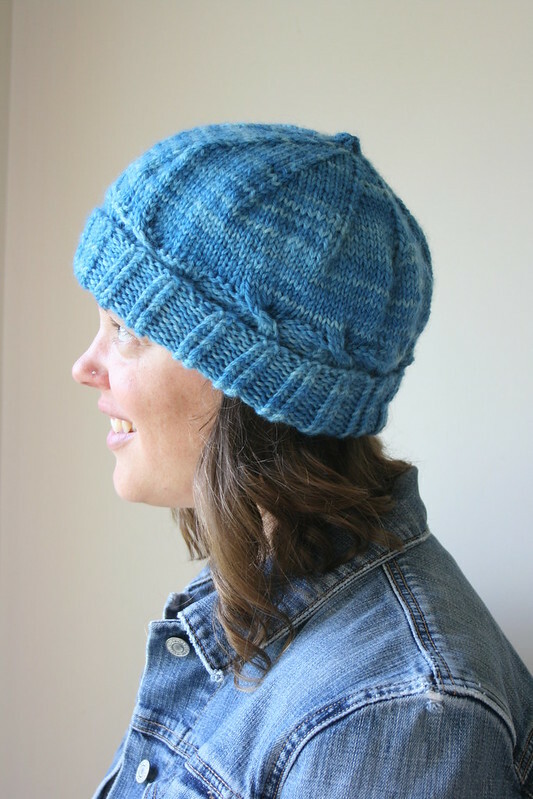 such a beautiful color – and your finished hat looks great even if it isn’t exactly what you were originally planning. I find that my different hobbies fulfill different purposes in my life. Knitting is something to do in front of the TV at night. Its generally about having something to do with my hands, but I do want to try new things and expand my knowledge. 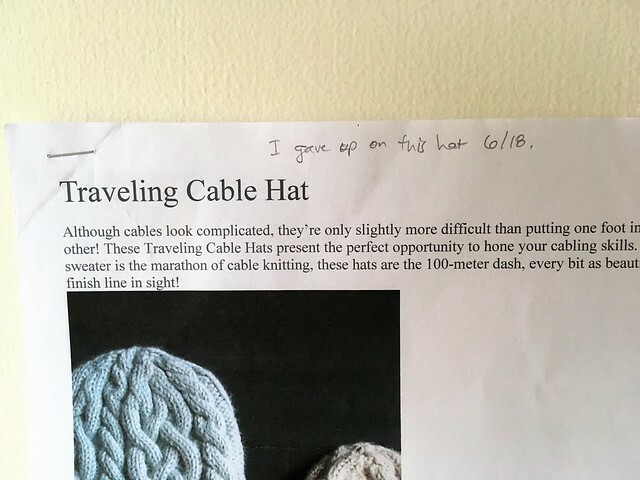 I like learning new techniques,but sometimes I just want to sit down and knit something without thinking about it. Sewing is something I do during the day and for me it’s more about the drafting and design – I’ve realised that the act of sewing itself isn’t really that exciting for me – its a means to an end. I love doing the design and drafting and then just use the sewing to see if what I was trying for came out as I had imagined. So many times I’ve been told “You should start a business” but I’ve thought about it and sewing things I’m not really interested in for other people has no real interest for me. On the other hand I’ve been commissioned to make one off things a couple of times and I love that as it’s all about the creativity. I find as I’m getting older that what I really like is to be able to make things – it really doesn’t matter what the medium is as long as I’m creating I’m happy! I think that’s exactly where I’m at. I guess I hadn’t really thought it through deeply, but I’m coming around to what you said—different hobbies fulfill different purposes. Thanks for the kind words. I just realized I didn’t see your whole comment the first time. I think I’m at the same place with sewing—I want to see the outcome. I also feel completely the same on the business aspect. Maybe that will change (never say never), but I don’t see it happening at this point, although I do want to work within the home sewing industry (hence the social media and editing work I currently do for Pintuck and Purl). I definitely feel that I was made to create. Sewing feels like my medium, but even if it isn’t always my first creative love, I think I will always need to make something. I sew primarily because I’m super tall (6’2″) and often can’t find things I want that will fit me. I also sew because it’s nice to have a creative outlet. I recently discovered your blog and have been reading through the archives and have realized that I’m not as organized in my sewing practice and sometimes rush through projects. This makes me make mistakes and maybe I don’t enjoy the process as much as I could. Anyway, I just wanted to say that I’m really enjoying reading your posts and I appreciate the fact that you have taken the time to share them with us. If I comment on your really old posts, it’s just because I’m catching up… I know you mention helpful books and other sewing resources, so I want to peruse back through and pick those up. Thanks! That means so much that you would take the time to look back through the archives! Thank you. I do the same thing when I find a new blog that interests me. As far as organization, I’m not always organized, but I do like to try something and then refine the process. It’s not so much that I want to do the same thing over and over, I just like refining the systems of how I’m sewing overall, if that makes sense. Everyone is different, though, so refine and organize if it brings you joy, but if it doesn’t, don’t! Like you said, it’s a creative outlet. And feel free to comment away. I’d love to hear your thoughts on different projects. Feel free to leave your own book and pattern recommendations. I love those.